Out from the Rough album which was Tina’s first solo album after her 1976 split with husband Ike Turner. Her first two solo albums, Tina Turns the Country On! (1974) and Acid Queen (1975), were recorded while she was still married to Ike Turner and also a member of the Ike and Tina Turner Revue. 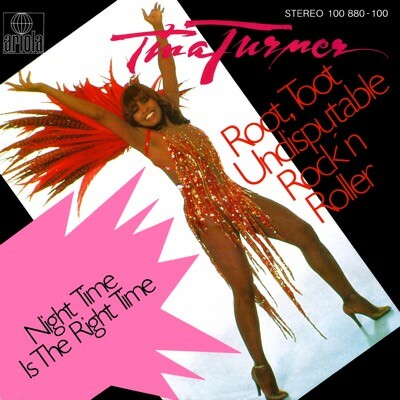 “Root Toot Undisputable Rock’N’Roller” was the third single out of the album and Tina performed this song on several TV shows in Europe and America. “Night Time Is The Right Time“ from the b-side was already recorded by Ike & Tina, but not released until 1991 on the CD “Good Old Times“. Here is Tina performing the song on ZDF’s Kultnacht in 1979 for the first time in HD on Youtube! Thanks Ben. It’s Nathan from the U.S. Great video! I hope you and your family are well. Namaste! Hey Nathan, good to hear for you! Hope you’re good as well! Thanks for your comment.